Citrus and herbs go hand in hand in this vibrant Lemon Thyme Cake. Light lemon cake if flecked with fresh thyme and layered with lemon buttercream. Add a ripple of homemade lemon curd for an extra pop of flavor and decorate with fresh thyme for a simple, rustic look. Perhaps one day my well of cake ideas will run dry, but thankfully that day is not today. Being able to incorporate seasonal ingredients and savoury herbs into sweet treats keeps the creativity following, and today I am happily sharing this Lemon Thyme Cake. I am not a rookie when it comes to incorporating more savoury elements into my cakes, however I think I've only scratched the surface when it comes to herbaceous sweets. My go-to is to infuse herbs into a simple syrup that gets generously brushed onto each cake layer. This time, I took a step further and added freshly chopped thyme straight into the cake batter. Adding the fresh thyme into the cake batter really helped the flavor shine through all of the butter and sugar. But if I am being honest, I think the real star is the lemon curd buttercream. Now, I've made lemon curd and I've made buttercream plenty of times, but the product of combining the two together proved to be otherworldly. Sometimes straight lemon curd can be a bit tricky as a cake filling, so I opted to mix it with my trusted Swiss meringue buttercream. Swiss meringue buttercream is fairly mild in flavor, making it the perfect base for other flavorings. But seriously, lemon curd buttercream - you guys, it's like heaven! Light and lemony - not too tart, not too sweet. But just for funsies, I took a couple teaspoons of leftover curd and swirled it over the buttercream just before topping it the next layer of thyme-soaked lemon cake. Now how good does that sound?!?! You can find the recipe for this cake over on the West Elm blog, where I'll be sharing several different herb-infused recipes over the next couple of weeks. I am excited to talk about West Elm today, not only because of this spectacular cake (it really is that tasty), but because I've just schedule my first book launch party at my local West End Market here in Vancouver! On May 14th, I'll be in the store with plenty of copies of "Layered ,"some sample recipes from the book to share, and may even be demonstrating some of the decorating techniques and how to ice a cake! So if you are in the area, mark you calendars and be sure to stop by! I'll even sign your copy, hehe. More details to come, so be on the look out if you are interested! We are having the most gorgeous spring so far up here in the Pacific Northwest - knock on wood. I know months of rain are still in the forecast, but it has not been nearly as cold as it usually is. I've only had to bust out my calf-length puffy jacket a handful of times and Baby H has not even had the chance to use his one-piece, fuzzy snowsuit (add that to the list of clothing items that he quickly grew out of before hardly using). For the rest of you all, I am truly sorry. I know some of you suffered from blizzards while my home state of California has already had 90+ degree weather (a preview of how hot summer might be, yikes!). However, no matter where you are, you can still enjoy a preview of spring with use of some winter citrus. In particular, Lemon. I especially love finding and baking with Meyer Lemons. They tend to be much sweeter and juicier than other types - bringing great, vibrant flavor to delicious, lemony desserts. 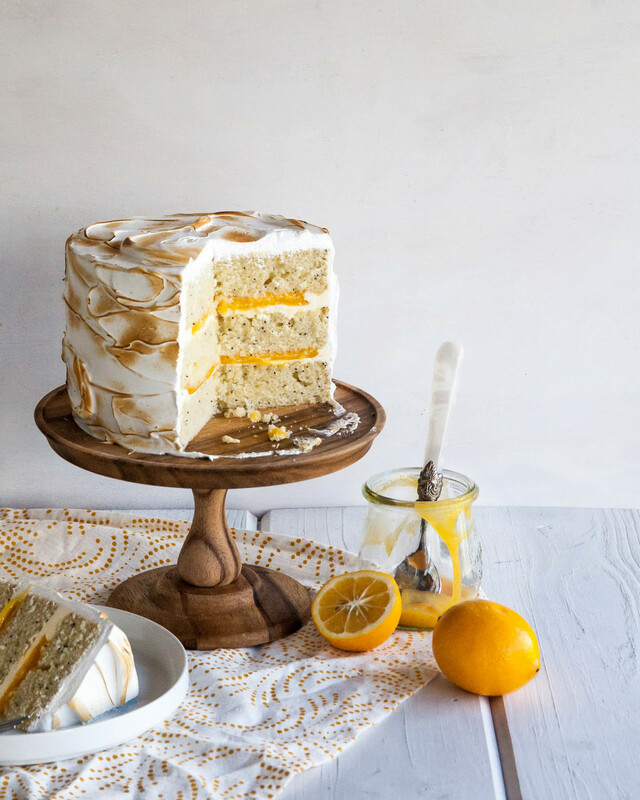 So whether you are aiming to match the spring sunshine you may already be having or need to beat your still-winter blues, this Lemon Meringue Cake is your answer. I made this cake for The Cake Blog (I'm back, baby!). The cake itself if extremely light. I tossed in some poppy seeds for texture and the fresh lemon and cardamom give a punch of flavor to an otherwise simple buttermilk cake. My kitchen torch got to make another appliance - as evident by the toasty meringue frosting. Find the full recipe on The Cake Blog.